Neiman Marcus socks in solid-knit. Contrast solid cuff, toe, and heel. 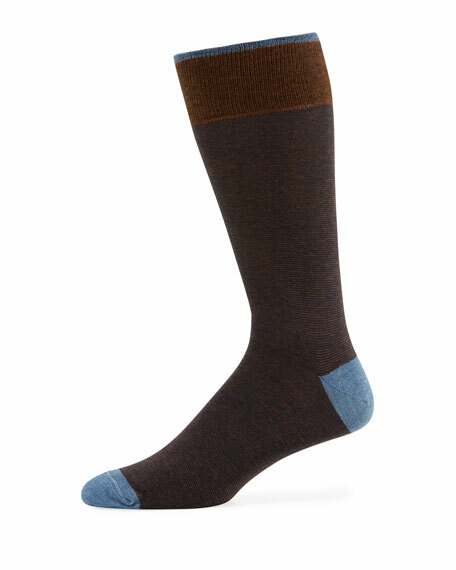 Ace & Everett "Thompson" socks in two-tone knit. Approx. 3"W x 10"L. Ribbed cuffs prevent slipping. Reinforced toe and heel. One size fits most. Supima® cotton/nylon/spandex. Made in USA. • Available in navy, charcoal, brown, or black. • Available in ankle or over-the-calf length. • Ribbed trim. • Cotton/nylon/Lycra® spandex. • Made in Italy. One size fits most (8-12).